Crocodile in Beirut | Melissa Tabeek. The cage used to try to capture the crocodile. Discarded animal remnants from the slaughterhouse were used as bait. Though croc-mania has died down in Beirut since the end of July, when the nearly five-foot reptile was spotted by a reporter in the putrid Beirut River, the crocodile continues to elude the team trying to catch it. Headed up by Jason Meir, the director of Animals Lebanon (the same animal support group where I adopted my kitten from), the team has spent days down by the river since it was first reported, even working in shifts to keep the hundreds of curious Beiruiti-s from their natural inclination to toss rocks into the water whenever they think they have spotted the crocodile. Days down by this river…a stomach-turning thought. We pulled up on the side of the road, next to the river. As soon as I stepped out of the car, the foul stench hit me. And kept getting stronger as I walked closer to the bank. 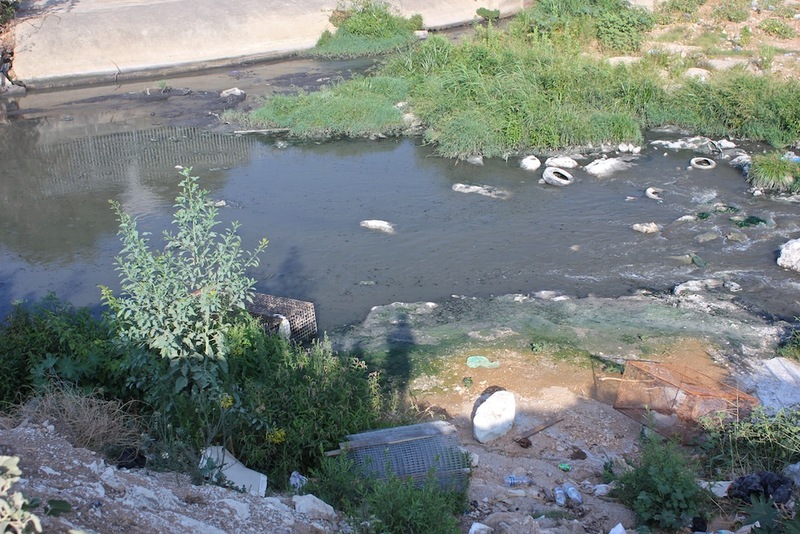 The water is dirty greenish sludge of bubbling garbage…yes, BUBBLING. It looks like it’s raining on the surface all the time. 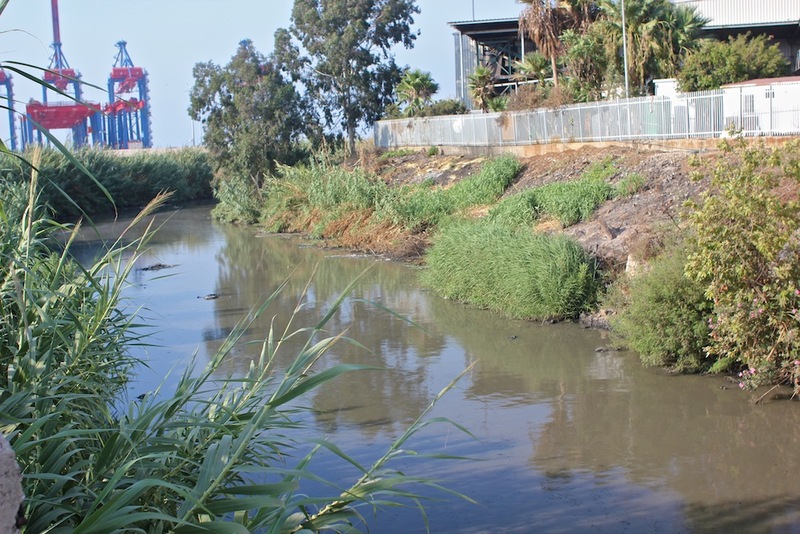 Not too unbelievable when you consider that the nearby slaughterhouse, a fish-processing plant and a Sukleen factory (waste disposal) all dump into the stream, which flows into the beautiful Mediterranean Sea. We were quickly joined by Basal, a 15-year-old who works at the slaughterhouse and is a de-facto member of the search-and-rescue party, as well as a champion croc-spotter. 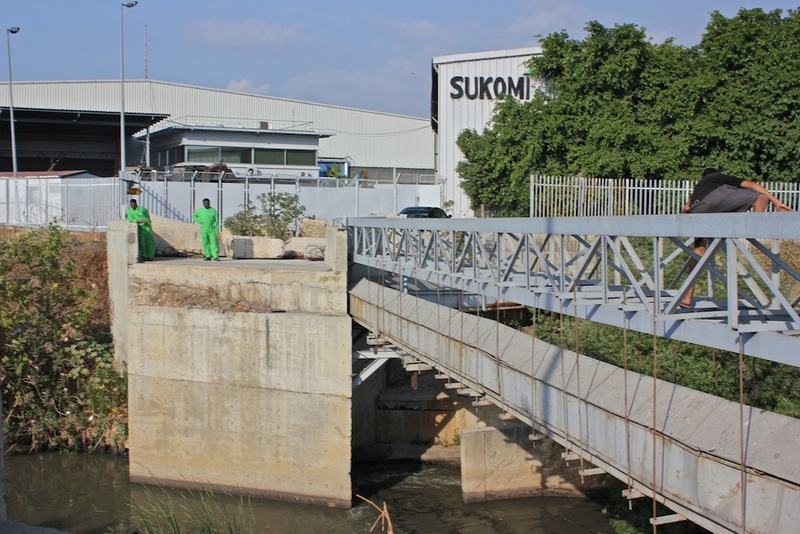 We didn’t think we were going to catch a glimpse, but after about ten minutes, two Sukleen workers began pointing toward the water. And I saw my first crocodile! Hidden underneath a tire. 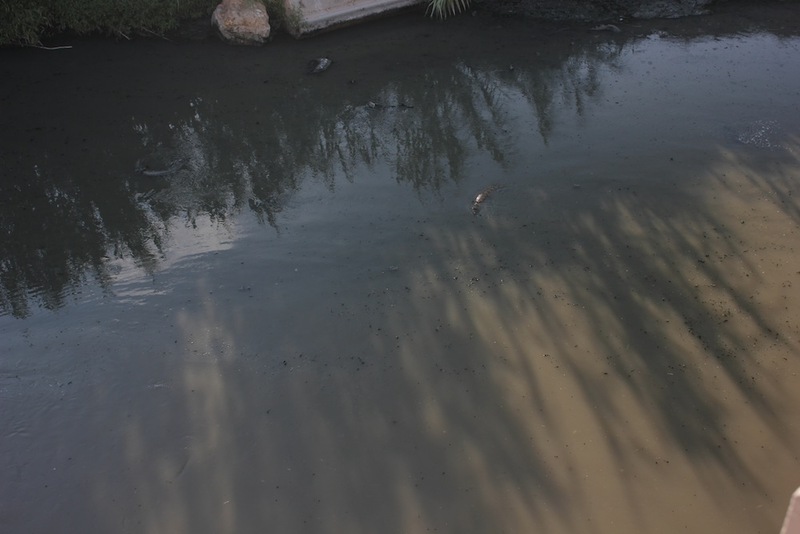 Sukleen workers, so familiar with the crocodile that they have named it, alert us to its spot in the river. The river flowing into the Mediterranean Sea. 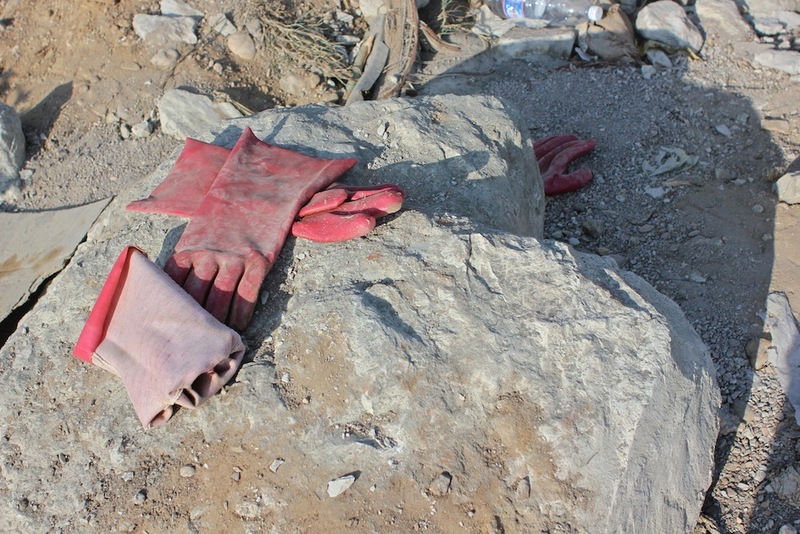 Working gloves by the river. According to Jason, the crocodile was probably dumped into the river after being bought from one of the many pet shops that sell exotic animals. Exotic animals are not a rare sight in Lebanon, which tops the international blacklist for illegal wildlife trafficking. 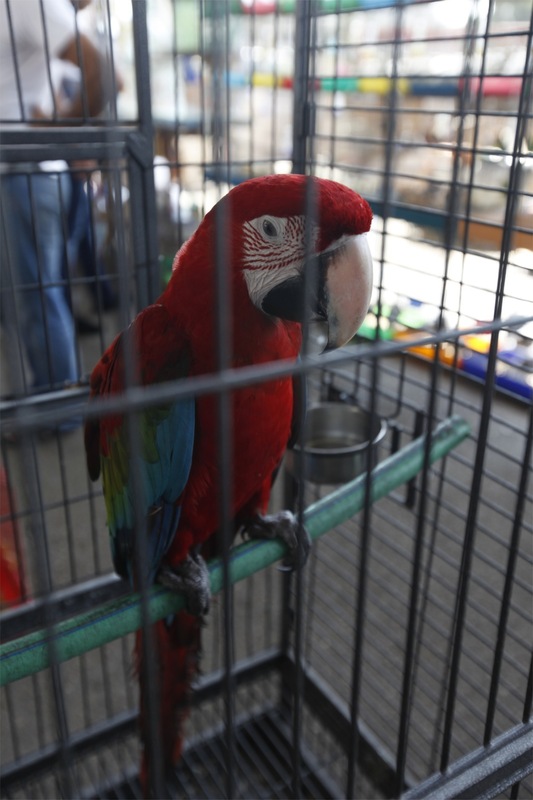 Even at the weekly Souk al-Ahad, you can see peacocks, monkeys, foxes from Syria and even macaws. 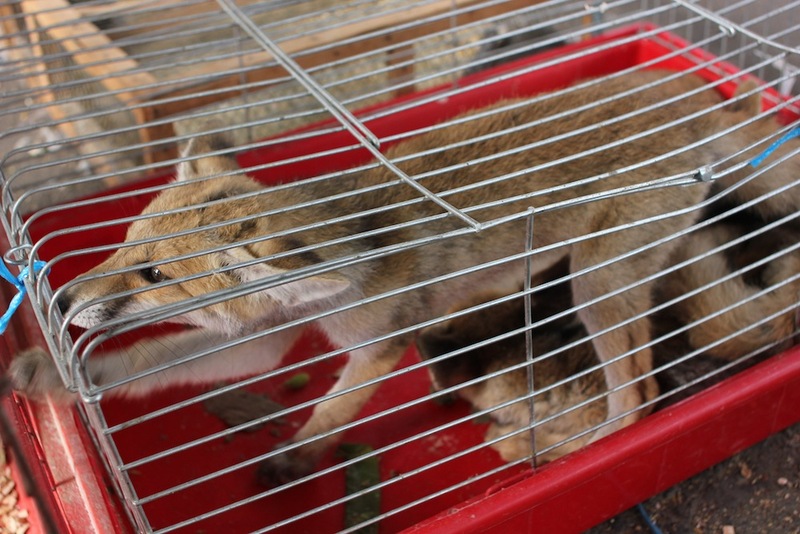 Foxes in Souk al-Ahad that have been brought from Syria. Jason said that if the crocodile stays, there is a high likelihood that it will die on account of its immune system shutting down. They have been trying to bring in experts to help with the capture, but now with the uncertainty of stability and the threat of a strike on Syria, things could get complicated. Like so many other people and things, even the crocodile’s rescue waits on a decision from Obama. Also…that description of the river, while vile, was pure gold! What a brilliant way to tie in more than just the fate of humans to Syria. This entire piece if a beautiful and tragic metaphor for the impending, uncertain fate, and almost certain death. Thanks, habibi! It’s so dang vile!